Level: This knob controls the volume of the repeats coming out of your pedal. When set to the lowest value you won't hear it at all, when it's all the way up to the max the repeats will be as loud as your original signal. 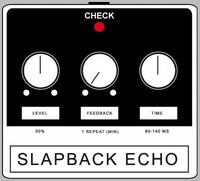 Feedback: This knob controls the amount of repetitions. The lowest value is just one single repeat of the note you play. To increase the amount of repeats, simply twist the knob further to the right. Time: This knob controls the time between every repetition of two notes. Almost every unit measures this in milliseconds (MS). If you've got a pedal where you can write in the numbers it's easy to control exact how many milliseconds will pass between each repetition, but chances are that your pedal won't have this feature. Most pedals don't, actually. Instead they mark out a few guiding numbers, like 50, 200 and 800 MS (these are the exact numbers of the Boss DD-3, for instance) and you have to turn the knob to a value somewhere in between and then adjusting it a bit. Some pedals, like the Boss DD-7, have something called tap tempo. This is a feature where you push the pedal switch four times in the same rhythm as the music, and the pedal will react to this, making the delay adjusted to your rhythm. A great feature! If you've got a song in a certain tempo you might want to use the delay in a way where it locks in really tightly with the beat. To do this, first make sure you know how many beats per minute (BPM) the song is in. A standard for the average pop song is 120 BPM (a heart often lies around 60 BPM when it's rested - at least if the people carrying it is pretty healthy - so therefore it is easy to feel a song in the double tempo of your heart. A trick used by hitmakers every day), a rock song might go faster and a doom or stoner metal song often is slower. What's important is that the song is locked in tight with this BPM and preferrably recorded with the aid of a metronome. Do you see the pattern? For each step, take the original number (60000) and divide it into two. So if you want to go the other way, making the delay pedal create half notes, then use 120000/BPM to get the amount of milliseconds. Now go ahead and look up the BPM of your own, or your favourite, songs. Do the math, set the controls on your delay pedal and fire away some really cool licks. And the formula for moving around this delay setting to different beats per minutes? Try this one: 45000/BPM.